Photograph courtesy of 305 Seahill. In France, artichokes will be on far more menus than in North America or the UK. That should not be too surprising as there are many more varieties of artichokes on sale in France. The season for most artichokes, which are a member or the thistle family, is from April through September; however, there are other artichoke varieties imported or in season at other times. Fresh artichokes, if the restaurant will pay the price for winter artichokes, will be on French menus twelve months a year. As far as most of us are concerned, with some notable exceptions, most artichokes look somewhat similar and affect the taste of different dishes in a relatively similar manner. 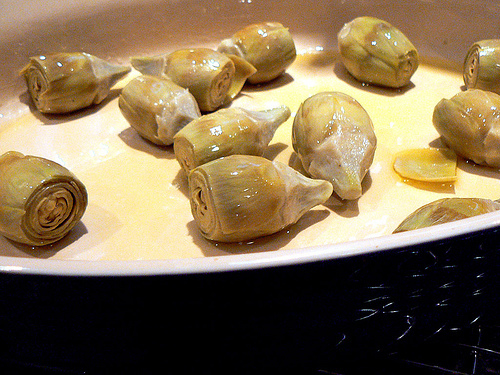 Many sauces leave the artichokes’ texture untouched but intentionally create different tastes. 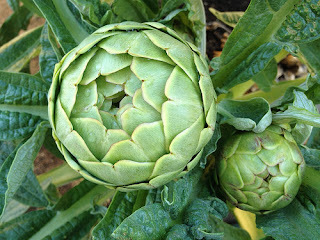 There is a large violet globe shaped artichoke that is very attractive, However, when I tried it I thought it tasted much like its green cousin the green globe artichoke, the most popular of all artichokes, . The young violet artichoke from Provence may be eaten whole. These and other baby artichokes are grown to be sold when small, before the choke has had time to grown. Baby artichokes make their differences known by sight and by taste. Most of France's small artichokes, including some that may be served raw in salads, come from the Provence and Languedoc-Roussillon regions. Many of these artichokes are rarely seen in the markets and supermarkets outside Mediterranean European so enjoy them when visiting. Italy and Spain have their own small artichokes and recipes. Poivrade is the name given to certain small violet artichokes from Provence, ay least until they get bigger. Artichaut Poivrade will be part of the name of any dish made with these edible, small, tasty, artichokes. Dining on the small artichokes. Baby artichokes are grown to be sold when small, before the choke has had time to grow. When you are served very small, baked, or otherwise cooked whole baby artichokes, you may you eat the whole vegetable, and that includes all the leaves. 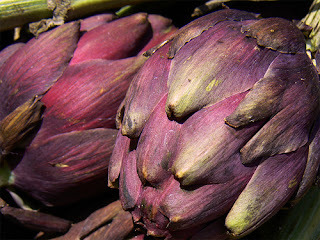 Many dishes use only the artichoke’s heart; the artichoke’s heart is the base of the plant, which attaches to the stem. Artichoke hearts are the popular for use in cooked dishes and as parts of salads. 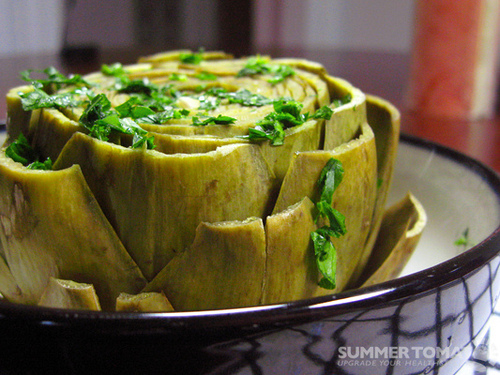 If you are served cooked artichoke hearts with the stem attached, you may eat most of it. The upper part of the stem tastes like the heart; sometimes it is a little stringy but is still enjoyable. 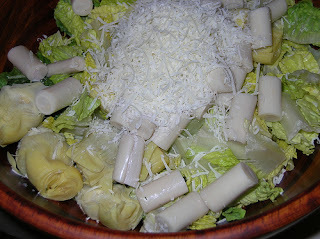 Cooked artichoke hearts may be part of salads as well as raw artichokes that are grown to be eaten uncooked. Cooked artichoke hearts served on their own with a vinaigrette sauce make a wonderful appetizer. Petits Artichauts Violet à la Barigoule et Copeaux de Truffe Blanche - Small artichokes prepared à la Barigoule and served with shavings of the white truffle. This is a dish that originated in Provence. However, the recipe used today is different to the original dish created nearly two hundred years ago. Today’s barigoule is made using the small violet artichoke braised in oil and white wine and stuffed with tomatoes and mushrooms, any mushrooms.The difference in recipes relates to the mushrooms used. You may eat all of the artichokes as there is no choke, and all the leaves are edible. On this menu listing, there are copeaux, shavings, of the truffe blanche or blanchâtre, the white truffle. The shavings will be added just as the dish is served, often when it is already on your table. How the truffle will be added. The truffle is added raw; if it were cooked or mixed with this dish while cooking it would quickly lose its flavor. The flavor and texture of a truffle, I find difficult to describe, and each type of truffle has different strengths and it is its unique recombination of taste and smell that grows on you. Some restaurants restrict the amount of truffle shavings added, and then no truffle experience will occur. Yes, I have also been to those restaurants where the dish has taken over the minute scrapings of truffle, not the other way round. With this menu listing, be careful, the lightly scented truffe blanche is not to be mistaken for the more famous and very expensive and much stronger tasting white Italian truffle from Alba. In French, the Italian truffle from Alba is the Truffe d'Alba or the Truffe Blanche d'Alba. France’s most famous truffle is the Black Diamond, the Perigord Truffle. N.B. Truffles are a fungus and unlike that other fungus, the mushroom, grow underground near the roots of oaks and other trees. Initially, pigs were used to search for truffles as their sense of smell is very strong, and they can detect the delicious food hiding below ground. Today most truffle hunters use dogs. Dogs can be trained to search for truffles and if they find one they will not try and eat it as a pig will. Also, your favorite truffle dog can come in the house and lie on your sofa. The family of a truffle hunter will not easily accept the truffle hunter’s four-legged friend coming into the house when it is a pig! Pigs are not politically correct in modern France. The original dish of artichokes à la barigoule goes back to the mid-1800’s. Then artichokes were cooked with the barigoule mushrooms that grew under or near the artichoke plants. That mushroom, now mostly called the lactaire or lactaire délicieux in France, is the saffron milk cap mushroom in English. The saffron milk cap is a tasty mushroom when well cooked; however, in most parts of France this wild mushroom is only in season from July through the beginning of October. With such limited availability and its relatively high price as it is a wild mushroom, in today’s artichauts à la barigoule there will be no wild saffron milk cap mushrooms. The name barigoule remains, but the recipe and the mushrooms used all year round will be different. Today’s recipes usually use the cultivated button mushroom, the champignon de Paris. Salade de Coeurs De Palmier et de Coeurs D'artichauts – A salad of hearts of palm and artichoke hearts; almost certainly served with a vinaigrette sauce. The hearts of palm do not come from the tall palm trees we see in the south of France nor from those that provide us with dates. The palm trees used, come from the tropics. These are palms that in one year grow large enough to provide the hearts of palm that we know. The palm trees grown for hearts are much like any other annual crop. In one year, these small palms can be harvested and new palms planted. All palm trees have hearts; however, with the fast growing small palm, no one has to cut down a 10 meter (30 foot) high tree and wait ten or twenty years until a new one grows in its stead. Tartare De Thon et Carpaccio d’Artichauts Violets, Copeaux De Grana Padano Et Olives Niçoises – A tartar of tuna and a carpaccio of young, small, edible, violet artichokes from Provence. The dish comes along with those special AOP olives from Nice and copeaux, shavings, of the Italian Grana Padano cheese. Provence’s Violet Artichokes, Nice’s AOP Olives, and Italian cheese shows that this recipe comes from Nice. Nice has a long connection with Italy. Nice was part of Italy until the 1860’s so do not be surprised by the inclusion of an Italian cheese. 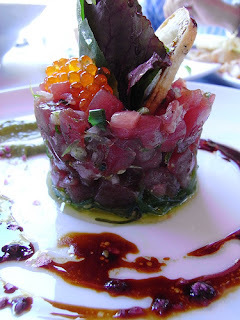 For more about Nice, its cuisine and history click here. For ratatouille click here, and for Salad Nicoise click here. Photograph courtesy of Javier Lastras. Consommé D'artichauts Violets À La Coriandre – A consommé made with violet artichokes and flavored with coriander, the herb. Consommés are clear or clarified soups originally made with meat and or poultry, with vegetables coming later. Barbouillade – A Provencal stew of baby purple artichokes prepared with white wine, streaky bacon and vegetables. French chef’s enjoy showing their knowledge and so only rarely is a simply prepared whole artichoke on a restaurants’ menu. However; occasionally a whole boiled, or steamed, globe or similar artichoke will be on the menu and served with a tasty dipping sauce on the side. In French homes, whole artichokes are more often on the menu as in this dish the artichoke dish is eaten cold and may be prepared hours or even the day before it is required. Whole artichokes prepared like this are a slow food and in a family or group setting keep the pace of fast eaters under control; that leaves time for talking about the day’s happenings. The first row of drier, outer leaves will have been removed when a restaurant serves this dish. In a private home you may need to do that. The next row of leaves on these cooked artichokes are easily pulled off one by one by one. Take a leaf and dip its base in the sauce provided. Then run the underside of the leaf over your teeth and remove the meat that is there and enjoy. You will have the taste and texture of the artichoke along with the sauce. Put the rest of the leaf aside in a bowl that will have been provided. A whole steamed artichoke for one; to be eaten with a dipping sauce. Photograph courtesy of Summer Tomato. After you have finished pulling off most of the outer leaves you arrive at a rough, stringy, inedible part, that is the choke of the artichoke. Cut out that stringy choke and put it in the bowl provided for the uneaten parts of the leaves. There, underneath the artichoke’s choke is the true prize, the cœur d'artichaut, the heart of the artichoke, the base of the artichoke. The heart is the tastiest part of the artichoke. Enjoy. Artichokes are a member of the sunflower and the thistle family. 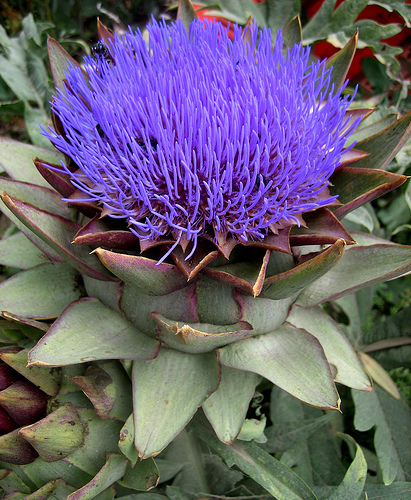 The choke will become an artichoke flower when left to grow. Artichokes in the languages of France’s neighbors. (Catalan – card, comú), (Dutch - kardoen), (German - artischocke), (Italian - carcifio), (Spanish - cardo). Dining well and differently in Nice. The Unique Cuisine from the City and the Comté de Nice. Salade Niçoise – Salad Nicoise. The Most Famous of all French salads; Named after the City of Nice, on the Cote d’Azur, Provence, France. What does Copeux, on a French Menu, Mean?